An ailing butterfly rests on a plant at the monarch butterfly reserve in Piedra Herrada, Mexico State, Mexico, Nov. 12, 2015. The number of monarch butterflies reaching their wintering grounds in central Mexico this year may be three to four times higher than the previous season, authorities said Thursday. Speaking during a visit to a monarch reserve with U.S. Interior Secretary Sally Jewell, Mexican Environment Secretary Rafael Pacchiano said initial reports suggest the butterfly population is rebounding. "We estimate that the butterfly population that arrives at the reserve is as much as three and could reach four times the surface area it occupied last season,'' Pacchiano said. He did not explain how the government made the calculation, but authorities conduct informal tracking of monarch butterflies as they enter Mexico from the United States. The population of orange-and-black butterflies making the 3,400-mile (5,500-kilometer) migration from the United States and Canada declined in recent years before recovering slightly in 2014, when the insects covered about 2.79 acres (1.13 hectares) in the mountains west of Mexico City. The monarchs cluster so closely in trees that their numbers are measured by the area they cover. They once blanketed as much as 44 acres (18 hectares). Pacchiano said the butterfly colonies could cover three or four hectares (7.8 to 9.9 acres) this year, and officials hope to reach six hectares (14.8 acres) in the reserves by 2020. "The United States is very committed to protecting the monarch butterfly, but we need the help of Mexico and Canada,'' Jewell said before hiking an hour into the mountains to see the trees where the monarchs roost. She said the United States is working to reintroduce milkweed, a plant key to the butterflies' migration, on about 3 million hectares (1,160 square miles) within five years, both by planting and by designating pesticide-free areas. Milkweed is the plant the butterflies feed and lay their eggs on, but it has been attacked by herbicide use in the United States. Mexico, too, still has problems. Illegal logging more than tripled in the monarch butterflies' wintering grounds last year, reversing several years of steady improvements. Pacchiano said the reserve's buffer area lost more than 20 acres (nine hectares) due to illegal logging in one area this year, but the tree cutting was detected and a number of arrests were made. Loggers cut down 47 acres (19 hectares) of trees in San Felipe de los Alzati in Michoacan state last year, the biggest loss since 2009. Illegal logging had fallen to almost zero in 2012. 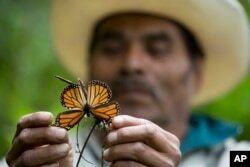 A guide holds up a damaged and dying butterfly at the monarch butterfly reserve in Piedra Herrada, Mexico, Nov. 12, 2015. The forest canopy acts as a sort of blanket against the cold for butterflies that form huge clumps on tree branches during their winter stay in Mexico. The migration is an inherited trait: No butterfly lives to make the full round trip, and it is unclear how they find their way back to the same patch of pine forest each year. Two years ago the butterflies reached a low point, covering only 1.65 acres (0.67 hectares), the lowest since record-keeping began in 1993. At their peak in 1996, the monarchs covered more than 44 acres (18 hectares). But since then, each time the monarchs have rebounded, they have done so at lower levels. The species is found in many countries and is not in danger of extinction, but experts fear the migration could be disrupted if very few butterflies make the long trip. Some of the communities earn income from tourist operations or reforestation nurseries to grow and plant saplings. But Omar Vidal, head of the World Wildlife Fund in Mexico, said poverty remains a problem among the communities.